The day had finally arrived. After weeks of preparation, it was time to pitch our tent and move into K-ville. Now I know what you’re thinking- it’s just pitching a tent, how hard can it be? Well let me tell you, it’s not nearly as easy as you think. We weren’t preparing for some family overnight campout where you find a spot that has only a couple of rocks in it, plop your tent on the ground, and call it a day. No, we were getting ready to build a tent site that would be able to stand against the mighty wind on a cold and muddy tundra and protect us from an onslaught of North Carolina rain (and possibly snow) for the next six weeks. Keep in mind, I talked to black tenters that had been out there for just one week already and said their tents were trashed. So bright and early (and by bright and early I mean 1:00 in the afternoon, bear in mind that we are college students) we set out to construct the most serviceable structure possible. We loaded up in two of my friends’ cars and headed over to West campus to set up for that evening, but believe it or not the first place we went was not K-ville. I kid you not, to begin our tenting process we scavenged for wood. 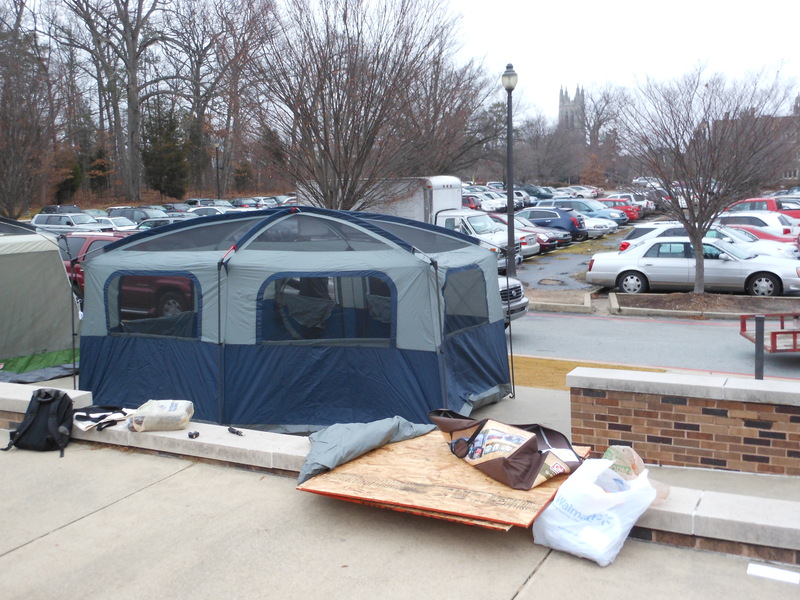 Very few tents actually sit directly on the ground in K-ville, and those that do often suffer the consequences when the rains come. The grass in K-ville slopes just about every which way, resulting in frequent drainage issues during storms, which as you can imagine wreaks havoc on tenters. Most people will try to build platforms under their tent to counteract this, putting their tents on higher ground and out of the way when floods occur. So off we went to find our wood. 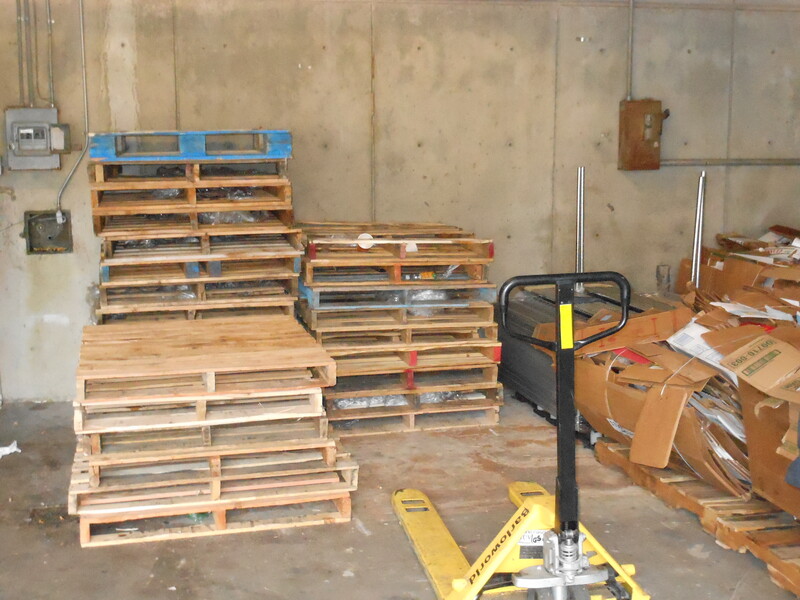 We struck gold at our first location- a loading dock underneath the McDonalds in the Bryan Center. There they had discarded of many pallets that would be perfect to support our tent. 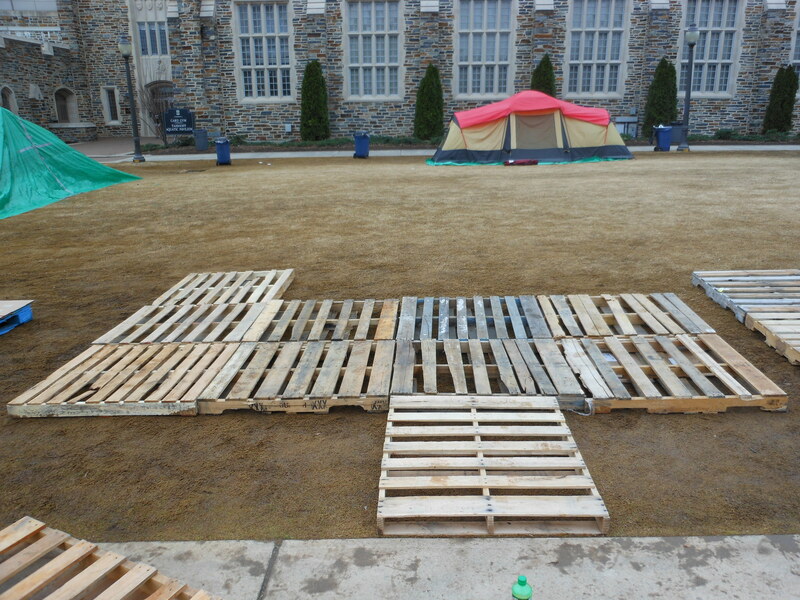 Students typically can find pallets like this strewn all over campus, including at the Duke Hospital and even on East campus, but luckily for us there were just about as many pallets as we needed. We began to carry the wooden supports up the hill toward K-ville, which proved to be a long and arduous process. Keep in mind, the tent we are using is very large, as it has to fit six people in it every night. It measures 14 feet by 10 feet (which is close to the average size of a room in Blackwell), so we needed to bring about 13 pallets. After pausing for a starstruck moment as Tyler Thornton walked by, we discovered a fantastic cart that was left unchained on the loading dock, so of course we borrowed it for our personal use. We were relieved to load up the rest of our pallets at once, and began to push the giant load up the hill toward our destination. We finally reached K-ville, and it was time to stake our claim. The search was on for the perfect spot to pitch our tent, one that would not flood easily and was accessible without having to weave through other tents. After about 15 minutes of searching we arrived at a consensus on a spot. It seemed to be the best spot available at the time of our arrival. As you can imagine, most of the prime real estate was taken up by the black tenters, but this spot was a very good one. It was right next to a sidewalk where we would not encounter too much traffic and the door of our tent would be easily accessible. It was also one of the dryer spots after some significant rainfall in the past couple of days. So a few of us began to set up shop and lay our pallets out while others went to Home Depot to pick up more supplies. It didn’t take too long to get our pallets laid out. We were able to set up a nice spot for our tent and in the process meet some of our newest neighbors. Many black tenters that we knew came over to greet us and offer advice while we negotiated this new process. Two additional groups of freshmen were in the process of pitching their tents directly on either side of us, so there was a bit of negotiating to do in terms of space. 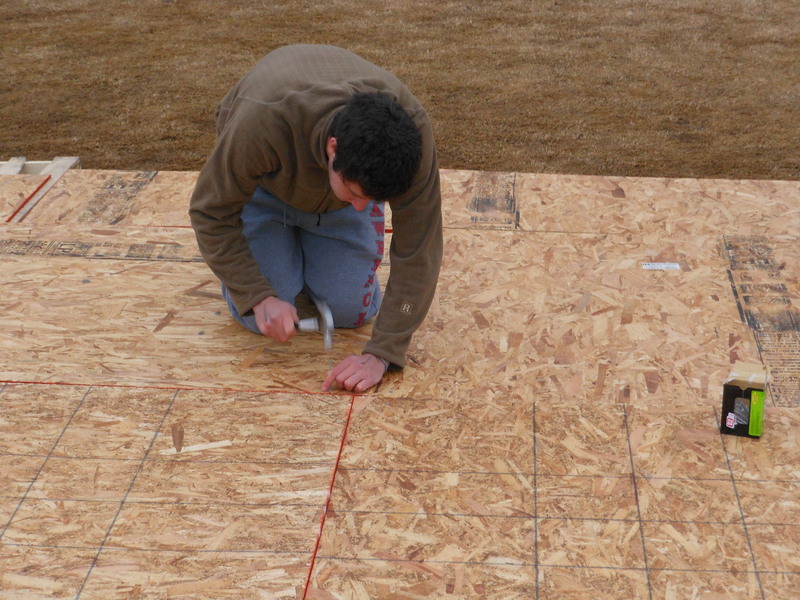 By the time we had finished with this, the rest of our tent members had arrived back from Home Depot with about 150 square feet of plywood. We were ready to strengthen the pallets we had gotten (a few of which were in less than pristine shape to begin with) by nailing the fresh plywood down on top. We laid the wood out over top of the pallets, and with two hammers and a set of nails began banging away. About an hour and a half, 50 or so nails, and quite a few sore thumbs later, we had secured the layer of plywood on top of our pallets and were ready to construct our actual tent. The pitching of the actual tent did not take that long. Luckily we had a few diligent outdoorsmen and a former boy scout in our tent crew, so this is one of the parts of the process that came the easiest to us. After the tent was constructed, we moved the tent from the sidewalk onto the platform. But the process was nowhere near over. We worked to secure the tent down and cover it with our rainfly. After this was done, we conferenced as a group and discovered that we needed a couple more supplies. One of our friends went to run and pick those up while the rest of us took a much needed dinner break. By 6:00 p.m. we were most of the way done. But there was much more still to be done. After a quick dinner most of us took the time to catch up on some rest or do some schoolwork (some of us had forgotten that we are still taking classes), the tent reassembled in the Giles common room at 9:00 p.m. to discuss the schedule for that week and divide up tent hours. A few of us had worked to divide up the daytime hours in advanced (considering our class schedules do not change from week to week), but we sought to divy up evening and weekend hours on a weekly basis. We met for about 40 minutes and discussed scheduling, final plans to complete our setup, weekly meetings, and general tent rules to follow. I unveiled to the group the master schedule a few of us had been working on for the very first time, which was just about the most intense Google Doc you had ever seen. It had contact info and class schedules for every member of the group, including everyone’s availabilities during the week at any given moment, along with the schedule we would follow during daytime hours and slots for the evening and weekend schedules. We then divided up the hours and sleeping schedules for the rest of the week and were ready to press onward. 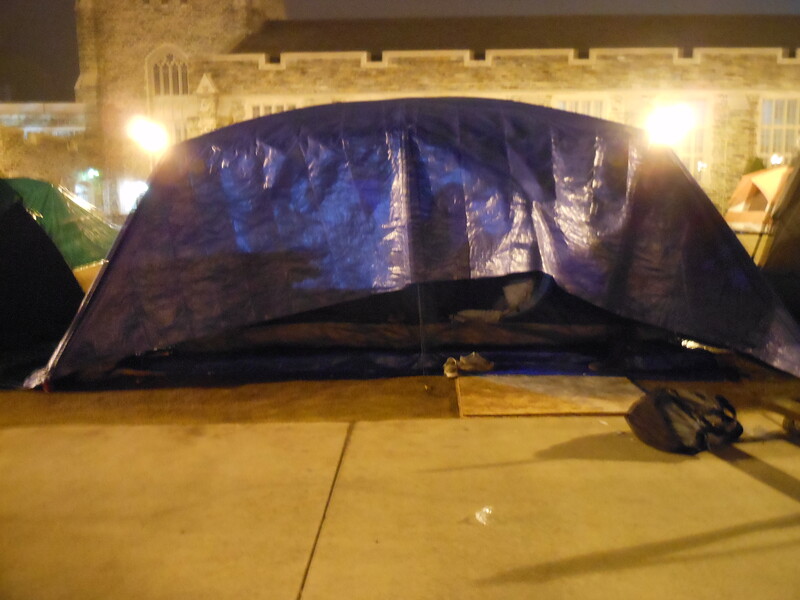 With the 11:00 p.m. deadline to start tenting looming, the six members that were sleeping in the tent that evening prepared to head back over to K-ville for the night. Two more of us including myself volunteered to head over and put the finishing touches on the tent. Around 10:40 p.m. we pushed off and made our final descent upon K-ville to begin our tenting season. 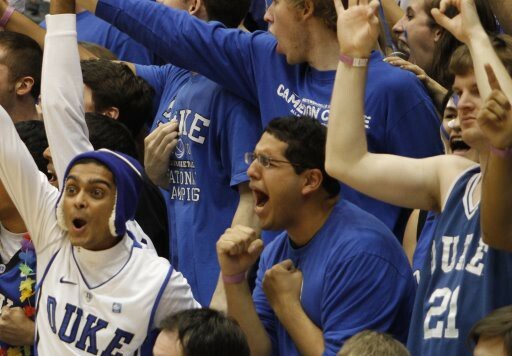 We arrived outside Cameron Indoor Stadium a few minutes before the 11:00 deadline. There were just a couple of things we needed to take care of before our tent was fully operational, but they would prove to be rather time consuming. Our mission was simple, we needed to adorn our tent with two tarps- one that would go underneath the tent above the plywood and one that would drape on top of the rainfly- to protect our tent from the elements. After speaking to countless experienced tenters, they all agreed that the worst possible thing that would happen to you in K-ville was for your tent to flood, so we took every step possible to make sure we would never encounter that situation. Getting the first tarp down underneath was no problem at all, but the second tarp was another story. One of our tent members had run out to the store around dinnertime to pick up this tarp and was struck with a dilemma- the store did not have sizes that accommodated us very well. One tarp was too small to fully drape over our tent, and one was a bit too big. He told me that it was bigger than what we needed, but clearly I didn’t understand how much bigger he was talking about. 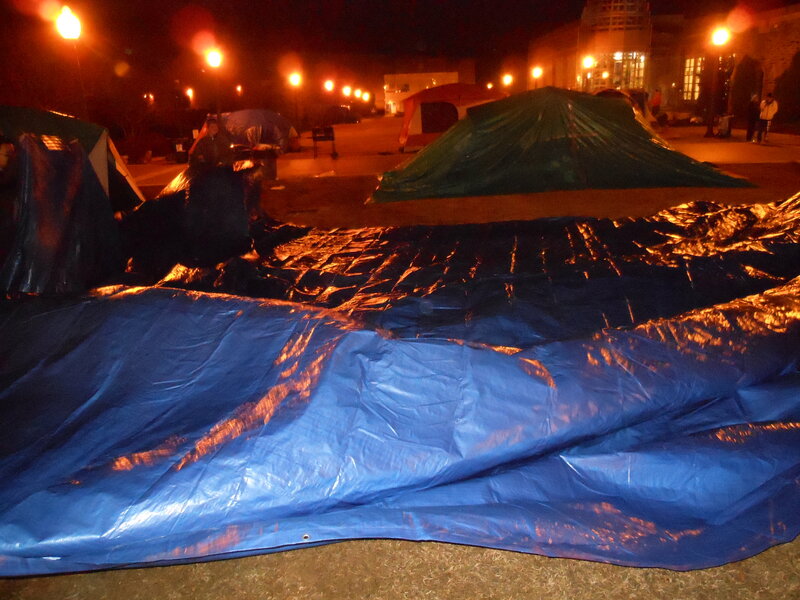 When we unfurled the glorious tarp on the field at K-ville, it nearly covered half of the makeshift tent city. Turns out that although our tent was 14 feet by 10 feet, we had bought a tarp that was 50 feet by 30 feet. That’s right- the tarp was 50 feet long. We considered a myriad of possible solutions, including folding the tarp over completely in both directions, draping the full tarp over both our tent and our next-door neighbors, and building some sort of complex irrigation system out of the massive tarp that was 10 times the area of our tent. We ultimately settled on folding the tarp in the way that best suited the size of our tent, using nature’s jack of all trades, duct tape, to secure the crease. After about an hour of figuring out the best way to drape this monstrous tarp over our tent, we staked it into the ground and our preparation was complete. It was now time for my friend Nathan and I, who had been enjoying our “day off” messing with the tarp, to say our goodbyes and head back to Giles. 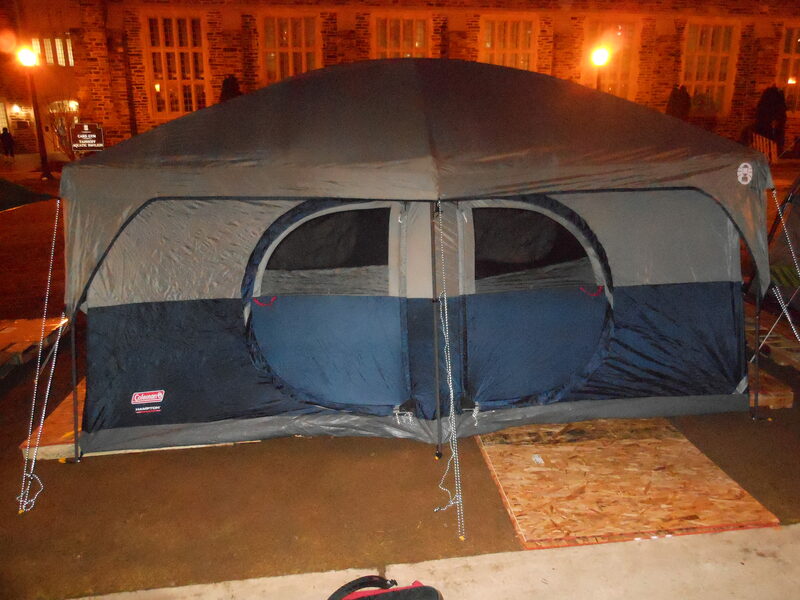 We left the remaining six members of our tent in K-ville to endure their first night as blue tent FF. We were able to make it back to our dorm by 12:45 a.m., finishing the setup process in a swift 12 hours. Not too shabby for some first timers. I’ll continue to keep you posted in the coming days on how my tent is doing. I hope you enjoyed reading about the beginning of our journey. Feel free to tweet at us to wish luck! As always, stay Crazie, my friends.